Hamlin, Maine along the banks of the St. John River. © Paul Cyr Photography. Maine’s rivers were once transportation hubs for Native Americans traveling by canoe from village to village or on hunting or foraging trips. Later on they helped European arrivals discover and develop the New World. Today, these same rivers still provide transportation, even if some of that traveling is the recreational kind. These ten rivers are the longest in the state. Some have played a part in early American history; others are remote waterways where the population of moose and other wild critters far outnumber that of humans. Up to date river maps are available from outfitters that rent canoes, kayaks or boats, from the Maine State Park Service and from Geological survey sites (geology.com). Other ideas would be to ask at fishing supply shops or use sites such as Take Me Fishing (takemefishing.com) for some pre-vacation information. Stretching 418 miles from its dual beginnings in both Maine and Quebec, the Saint John River eventually flows into the Bay of Fundy. The Maine section, called the Baker Branch, begins at Saint John Pond in Somerset County, north-western Maine. The second branch emerges near Saint-Zacharie, at the Quebec/Maine border. Together they not only create an international border between Maine, Quebec and New Brunswick, but western Aroostook County’s main river. One of the largest border crossings is at Fort Kent. The Abenaki Indians called this part of the country home and crossed back and forth at whim. Maine’s portion of the river, some 100 miles of it, flows through wild forestlands and canoes were the easiest way to travel. Early Europeans, particularly those hunting and trapping, followed suit. Samuel de Champlain himself used part of the waterway to explore the area and named the river after St. John the Baptist. Today that same stretch of river, from St. Francis to Hamlin, is home to the Voici the Valley Cultureway, dedicated to the Acadian way of life. These are the descendants of the Native Americans, Scots, French, English and Irish that settled in this fertile valley. A self drive tour of the valley has you crossing the river several times. The St. John River is also part of the Northern Forest Canoe Trail, 347 miles of which are in Maine. The trail is also part of the Allagash Wilderness Waterway, a popular canoeing and kayaking waterway. The Allagash River flows into the St. John River, and it’s a 37 mile paddle from there to Fort Kent. The Maine section of the river is known for its muskellunge fishing, muskie for short. The fish are large and are fighters. Two campgrounds are found in St. Francis and St. John and there are several small islands to explore. Water levels are highest in the spring, due to the snowmelt. In the fall, it is possible that the water may be so low that you have to portage, or carry, your canoes for a bit. This 178-mile long river is shared by Maine and New Hampshire. It feeds into the larger Kennebec River in Maine at Merrymeeting Bay and then eventually flows into the Gulf of Maine. “Androscoggin” is an Abenaki word, meaning “river of cliff rock shelters.” The Maine section begins at Umbagog Lake, loops back into New Hampshire and then comes back into Maine in the White Mountains. It runs through Bethel, Rumford, Dixiefield and then south to Livermore Falls. Now you are out of the mountains, passing through Auburn, Lewiston and Brunswick. The river is popular for anglers looking for brown, rainbow and brook trout, smallmouth bass and landlocked salmon. The upper parts of the river are cool enough for largemouth bass, but that is more in the New Hampshire section. The Androscoggin River is swift flowing and descends eight feet for each mile, making it the perfect choice to power sawmills, gristmills and other industrial businesses. Though there has been concern about pollution for some years, conservation measures have improved the river’s condition. The closer you are to the Blue Mountain runoff, the friendlier the river is to people and fish. This is the river where the Virginia of Sagadahoc was launched. It was the New World’s first ocean going ship, built by English-speaking craftsmen and was the beginning of the ship building industry on the Kennebec. The city of Bath actually had a dual identity, the “City of Ships.” The river was also used to harvest and export ice. Before that, it was part of the route that Benedict Arnold took in 1775 on his way to invade Quebec. At one time this river had an abundance of native fish including the Atlantic salmon. The damming of the river to produce hydroelectricity reduced those numbers severely. In 1999 the Edwards Dam was removed and the fish are rebounding. The wetlands area, particularly near the Atlantic is great bird-watching territory. The Steve Powell Wildlife Management Area is just north of Merrymeeting Bay. It sits on Swan Island and is accessible by kayak or canoe. The tide fluctuates between five and seven feet, so boats are not advised. Overnight camping is allowed. Signs are posted when the river is not suitable for swimming, due to storm runoff. Beginning at Saco Lake in New Hampshire’s White Mountains, the 136-mile long Saco River enters Maine in Oxford County. It flows past Fryeburg and becomes part of the Old Course Saco, often called the Canal. This is a man-made part of the river, six miles long, created in the 1800s to cut down on shipping time for local farmers. The original waterway is silted over. At Lovell, the Canal meets the original Saco. The water powers six hydropower plants, runs underneath Interstate 95 and flows between Biddleford and Saco. A bridge along Route 1 connects the two cities. It ends at the Atlantic, in Saco Bay. This is a recreation lover’s river, particularly in summer. On a stretch between Swan’s Falls and Brownfield, canoeing, kayaking, camping and picnicking are popular. Most of the year stretches of sandy beaches line parts of the river. The snowmelt sometimes floods the beaches in the spring. Walker’s Rip is a challenging set of rapids. Fly-fishermen hit the Saco in search of brook, rainbow and brown trout. At 117-miles long, the West Branch Penobscot River starts at Seboomook Lake in Somerset County. Most of its water comes from the North and South Branches of the Penobscot River. Running 25 miles east, it flows into Chesuncook Lake, then into the south-western edge of Baxter State Park on its way to the Pemadumcook Chain of Lakes. It then joins the East Branch of the Penobscot in the town of Medway. The 14-mile stretch going through Baxter State Park is known for its challenging rapids, ranging from Class 3 to 5. Kayak and rafting trips are offered by local outfitters, some of them overnight outings. Though fishing for trout is possible in quieter parts of the river, it is the white water action that put this river on the map. The rapids are most challenging during the spring runoff. The 112-mile long Aroostook River begins in Millinocket and Munsungan Streams in Penobscot County. It then flows east through Ashland, to the north of Presque Isle and slightly east of Caribou, all in the Aroostook Region in Maine. 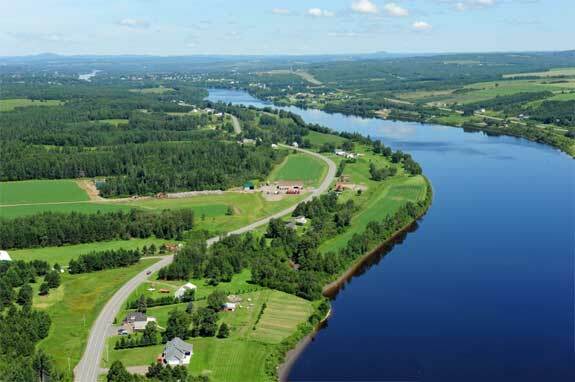 The river then crosses into Canada and meets the St. John River in Aroostook, New Brunswick. The river does have some Atlantic salmon, but their numbers are decreasing. Hikers on the International Appalachian Trail follow the Aroostook for miles, eventually crossing into Canada at Fort Fairfield, Maine. Canoeing and kayaking are possible except during the spring thaw. The river floods fairly frequently due to snow melt and ice-dams that form when the river ice breaks up and jams up against jutting shorelines or bridges. Parts of the river were the site of the Aroostook War in the 1830s, when the Canadian/US Border was in dispute. At 109 miles long, the Penobscot River is number seven on our list. If you include the West and South Branch, the length is 264 miles and becomes the second longest river waterway in the state of Maine. All branches of the Penobscot begin in north-central Maine, draining from a number of lakes. They all converge at Medway, flowing south to Bangor. Once past Bangor, the river becomes a wide, deep waterway, used for transportation of people and goods, and for recreational boating. The river ends at Penobscot Bay, ultimately joining the Atlantic Ocean. The Penobscot River and Bay were both battlegrounds during the Revolutionary War and then the War of 1812. The British Navy used the waterway to destroy Bangor. Later, the Federal Government built Fort Knox, an imposing granite structure that has yet to see battle. It sits across from Bucksport and is one of the most popular landmarks. The river is navigable by fairly large ships, particularly at or near high tide, which averages 13-feet. Boaters should keep their eye on tide tables to keep from grounding out. Smallmouth bass and landlocked salmon are popular game fish on the Penobscot and fly-fishing is possible in the quieter, shallower section. Atlantic salmon are also found, but these, if caught, must be released as they are an endangered species. How appropriate that the state of Maine has a river with the name of Moose. This 83-mile long stretch of water begins at Jackman near the Canada/US border. It flows northeast to remote Moosehead Lake near Rockwood. Near Jackman the river flows through a number of small lakes and ponds, making this a great venue for a canoe camping trip. Called the “Bow Trip,” it allows paddlers to start and end their trip on Big Wood Pond or Attean Lake. This is a prime location for brook trout. Once east of the lakes, Moose River flows through the forest. Landlocked salmon start showing up in the waters, along with the brook trout. Some parts of this river are quite low during late summer, more suitable for fishing with waders than in a boat or canoe. There is a mile stretch of river sitting below the Brassau Dam, which is known for exceptional brook trout and landlocked salmon fishing between May and September. Since the fish originate in Moosehead Lake, they are larger than their upstream cousins. The river is suitable for swimming, except for the spring runoff which may make sections unsafe. And true to the name, moose are often seen along the riverbanks, searching for lunch. The 75-mile long East Branch of the Penobscot River is one of the most remote sections of the Penobscot River system. The area from Matagamon Dam to Whetstone Falls is an angler’s paradise with healthy populations of landlocked salmon and brook trout. Like much of the Penobscot, this river is known for rapids, with the fifteen miles before Whetstone Falls being challenging but navigable. It’s best to join a kayaking of rafting tour if you don’t have much whitewater experience. Much of the East River is explored by canoe or on foot. Multi-day backcountry trips, requiring you to portage, or carry, your kayak on parts of the river, are strenuous, but rewarding. Primitive campsites let you sleep under the stars and commune with nature. Because of the remote location, the East Branch has some of the best fishing in Maine. At 75-miles, the St. Francis River is the tenth longest river in Maine. It starts at Lake Pohenegamook between Estcourt Station in Maine and Estcourt, in the province of Quebec. It travels southeast to join the St. John River in the town of St. Francis. This river is also part of the international border, with a crossing at Lake Pohenegamook. The St. Francis connects several lakes and is popular with paddlers taking extended wilderness trips. Primitive pull outs are found along the river, along with spots suitable for camping. This river is pretty much in its natural state, so you might encounter rapids, log jams, beaver dams or other obstacles you might need to work your way around. Trout, landlocked salmon and muskellunge are plentiful for those wanting to do a bit of fly-fishing. Moose are often found along the shores of this remote waterway.